The Teatro de la Zarzuela plays an essential role in preserving, study, retrieval and dissemination of our operatic heritage. It is for this reason elemental and indispensable, among others of equal importance, the programming 'Maria del Pilar', zarzuela in three acts Gerónimo Giménez, It is one of the most healthy and supportive milestones of the season. Libretto by Francisco Flores and Gabriel García Briones, the score, in the words of the expert musicologist María Encina Cortizo, He has "traces masterpiece that has inexplicably disappeared from our lyrical canon like many others, today unjustly forgotten ". It premiered at the Teatro Circo Price in Madrid's Plaza del Rey (where today the Ministry of Culture and Sport is located) he 17 December 1902, and after 26 programmed functions for the occasion, He programmed again only sporadically in that coliseum and very timely in provinces. For this reason, on Friday 30 of November (20h00), and Sunday 2 from December (18h00) They will be two particularly valuable days for our lyrical. The play, from which no recording recorded some, It will be heard more than a century after its last hearing. It will be in concert and free adaptation of the renowned playwright Maria Velasco. New music, so, to our ears the XXI century. Both concerts will be dedicated to the memory of the beloved Master Jesus Lopez Cobos, who had charge of directing if death would not have been surprised last March at his home in Berlin. His place on the podium will be assumed by Oliver Diaz, musical director of the Teatro de la Zarzuela, and one of the most prominent and sought Spanish masters today. The teacher should face the melodic inspiration, demanding writing orchestral and vocal solvent speech that make up the imposing composition 'Maria del Pilar', all characteristics typical of a musician (Gerónimo Giménez) who spent part of his life to the baton. If we add to these conditions the need for a large orchestra and a large chorus, we will be, the safest, before the main reasons for the evaporation of this zarzuela of funds from our lyrical repertoire. Likewise, to alleviate these difficulties, the orchestra and the chorus must necessarily "wrap" voices ringside. And that's what the Teatro de la Zarzuela has assembled for this new, historical coming-of 'Maria del Pilar'. 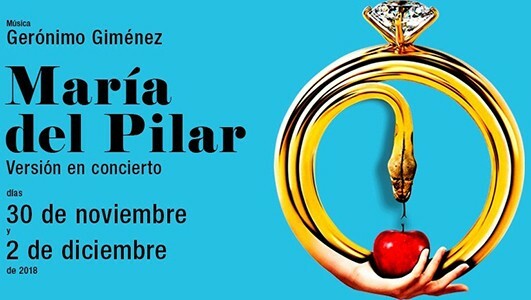 the soprano Carmen Solis will play the role of Maria del Pilar, in love with Rafael faithful, a Don Juan who left town after leaving malheridos some hearts. The role of Esperanza, another of the "victims" of Rafael, that the disappearance of this married with her brother Valentin, The landlord, I assume the Polish soprano Iwona Sobotka. the mezzosoprano Marina Rodriguez-Cusi It will act as senna Nieves, cook who lets wooing by Uncle Licurgo, father of Maria del Pilar and assistant Valentin. Rafael, heartthrob after all returns to town, brother Valentin and former boyfriend María del Pilar y Esperanza, She is now married to his brother, It will be played by the tenor Andeka Gorrotxategi. The bass Rubén Amoretti give life to Valentine, jilted to the extent of the tragedy with his brother to learn the ancient relationship between this and Hope, now his wife. baritone Damian del Castillo It will be Marcelino, which seeks unsuccessfully Maria del Pilar, who surprisingly he remains true to his love for Rafael. The bass David Sanchez She will sing the role of Uncle Licurgo and tenor Jorge Rodríguez-Norton that of Almendrita, worker secretly in love with Maria del Pilar, and witness this intrigue. As the story recreated by María Velasco is the testimony of the latter character, Almendrita also recounts the events through voice Mario Gas, one of the undeniable attractions of this happy proposal. The Community of Madrid Orchestra, Titular del Teatro, Titular Choir and the Teatro de la Zarzuela, completes the artistic picture of this historical recovery. Zarzuela 'Maria del Pilar' was very well received by the public, as stated unanimously Press then, having to repeat several numbers the night of its premiere. representations. From that date, It is interpreted only on specific days -15, 18 Y 24 from January, 8 February and 4 of March-, and provinces, for example, he 13 of April, the same company's debut at the Calderon Theater of Valladolid. The score of 'Maria del Pilar' manifest not only the creditworthiness of a composer who, as colleagues of his generation -Thomas Breton, Ruperto Chapí or Emilio Serrano and Ruiz was able to expand his training at the Paris Conservatoire (1874-1877) and Rome (1877-78); but also a musician who knows the national lyrical context as teacher and composer concertador; and a director of symphonic music. Not in vain, this differential quality is highlighting Cecilio de Roda in his critique published in The Times the day after the premiere: "What most excels in the score of the master Giménez is the way are treated the voices and the orchestra. hand experienced for so many years has led campaigns Concert Society it is always seen, and technical depth of which is thoroughly familiar with the masterpieces of the great geniuses of music ". Encina Cortizo stresses in short where the secret of the greatness of this work is battered, and the importance of their forced recovery: "The melodic inspiration, the demanding vocal writing and orchestral solvent speech, own a musician who has spent part of his life to the baton, define a score with traces of masterpiece that has inexplicably disappeared from our lyrical canon like many others, today unjustly forgotten. Serve this historical recovery of the Teatro de la Zarzuela as fair compensation. "